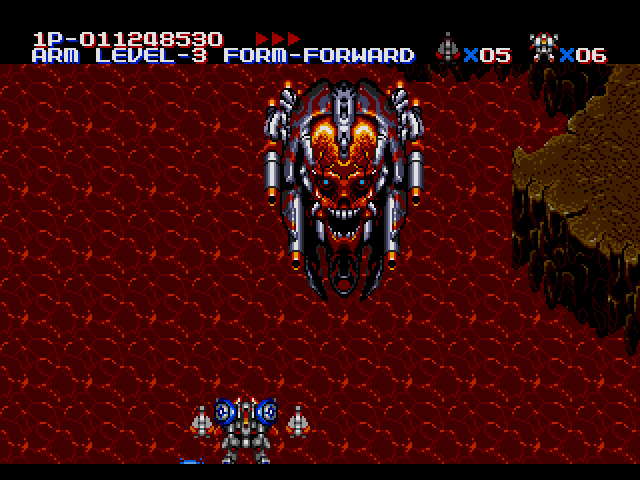 I won’t forget the first time I fought an enormous cyborg/human face in MUSHA. It descended slowly onto the screen, eyes shut, robotic tentacles attached to the side and back of its skull. Suddenly, its pupil-less eyes opened and explosive cogs shot out its mouth. Rectangular pieces of the wall burst forth towards me at different speeds. I moved constantly to avoid their touch. When the wall wasn’t blocking my view, I rained bullet death upon the face. It jittered every time it took a hit. Eventually, the face’s eyes shut and it opened its mouth. Explosions erupted around it. It looked in great pain, like it was screaming, but there was no sound other than the music. The face dissipated, then it was back to the onslaught, like nothing had happened. MUSHA is full of surreal, overwhelming moments like these, moments where you don’t have time to understand what’s happening to you. You keep moving, keep firing, and pray that you keep your head while chaos continuously erupts around you. 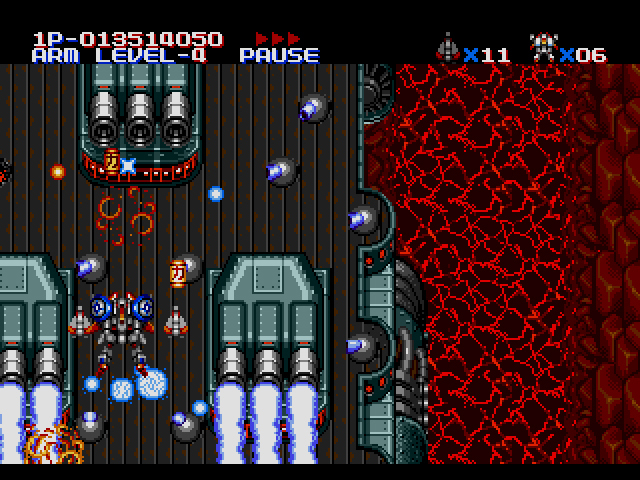 It is an uncompromising, unapologetic shoot-em-up, and one of the best I’ve played on the Genesis. You play as Terri (a.k.a. Ellinor in Japan and Europe), a mech fighter pilot whose entire squadron has been destroyed by the robot armies of Dire 51. The latter is a once-peaceful supercomputer gone rogue, now intent on killing off all mankind with its legion of mechanical terrors. Probably best not to land on that symbol of ancient evil. If you wait to start the game, a brief animated intro will play, showing main character Terri and her mech squadron on their way to infiltrate Dire 51’s base. The intro’s too short to get a feel for each member’s personality, but based on the mild banter, you understand that they are used to fighting with each other. Without warning, mechs start getting hit. Each of Terri’s squad is shot down by a huge laser. When the game finally begins, only she remains, left to face the overwhelming nightmare alone. Well, not completely alone. Terri’s mech, properly equipped, is a beast, and will keep her company on her dark journey. There are three special weapons: the Blazing Beam, which shoots solid green laser beams forward out of her mech; the Vanishing Buster, a bomb cluster with a decent spread; and the Defensive Detonator, a shield that also kills enemies if they get too close. All of these can be upgraded up to four times. If you get hit once, you lose your upgrade, but remain alive. Get hit again and you die. Ladies and gentlemen, pagodas on rails! In addition to the special weapons, power chip containers emerge on a regular basis. Shoot them to collect the chips and gain an option, a mini jet that will fight by your side. Three chips gains you one option, six chips gains you two, and the more chips you have, the more options will stockpile in your inventory. You can only have two by your side at any one time, but if one dies, another will instantly take its place. The options only fire in one direction at a time, but you can choose from six different directions, including in front, behind, and rotating around you. With two options strapped to your mech and an upgraded weapon, it’s impossible not to feel like an invincible supersoldier. MUSHA does an excellent job at both making you feel like you can take on the world, and humbling your ego when you’re doing really well. Within each level, there are points where you will easily destroy any enemy that comes into your line of sight. 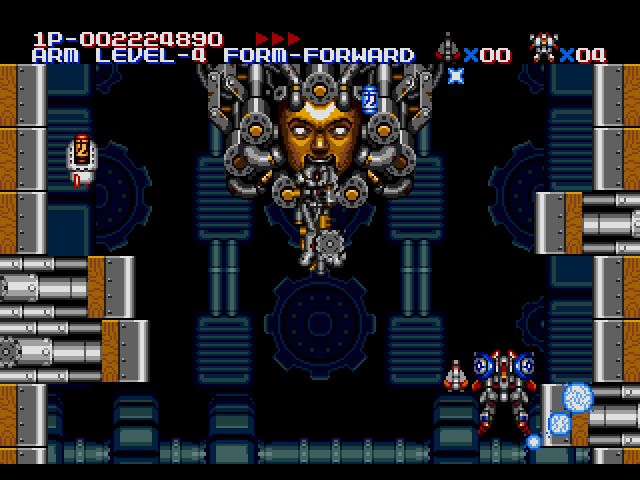 There are also times when four different types of enemies swarm the screen and unleash homing missiles and projectiles and lasers all at once until you realize you’re not as awesome as you thought you were, and it’s only God’s grace that’s kept you alive this far. Just as the story is slightly more detailed beyond the conventional “save the world” premise, so too are the enemy designs, which range from slightly off-kilter (spider robots, flying eyes, other mechs) to downright terrifying (any of the flying heads). The levels aren’t quite as creative, but they have their moments. Flying amidst the clouds and floating Japanese castles is both eerie and beautiful. Likewise, navigating through the constricting corridors of level 3’s cave while a river of lava runs below you provides an unsettling sense of scope. Neo-Tokyo’s taking pretty good care of itself. MUSHA‘s soundtrack perfectly reflects the insane on-screen action. The guitars, drums, and synths are relentless, like the notes can’t wait to express themselves. Composer Toshiaki Sakoda wields the Genesis’ Yamaha sound chip like a weapon, with each track a prog-epic unto itself. I’ve come around on the Genesis’ sound in recent years, but even I didn’t know it was capable of making such beautiful noise. A masterful achievement. 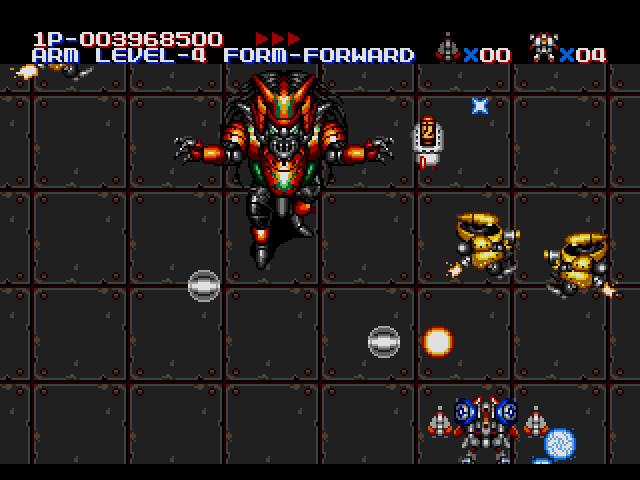 MUSHA is actually the fourth entry in Compile’s long-running Aleste series, which began on the MSX. 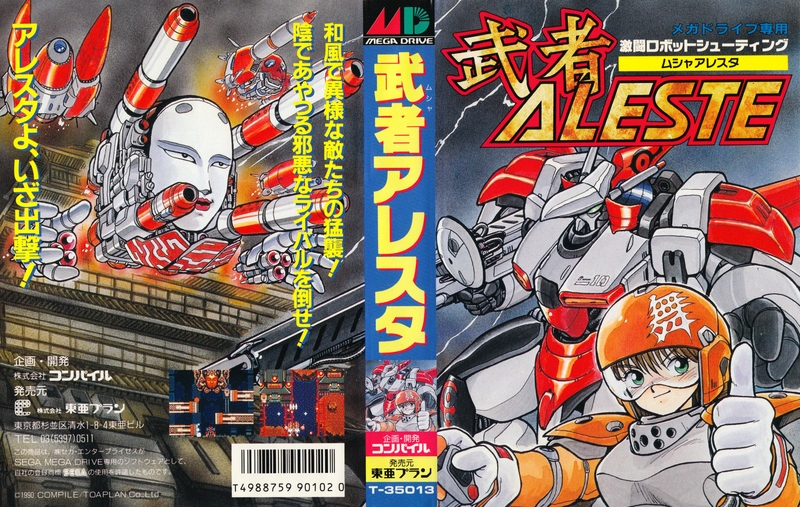 While the original Aleste was eventually released in Europe and the States as Power Strike, its direct sequels – Aleste Gaiden and Aleste 2 – were released on the MSX in Japan only. 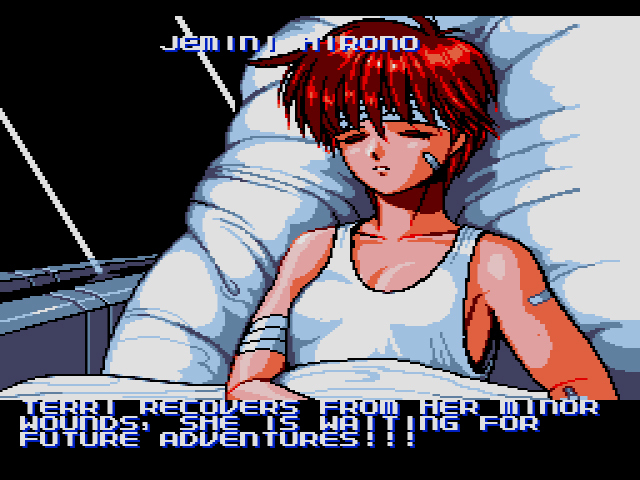 Although main character Ellinor (or Terri, depending on where you’re from) does make a return appearance from Aleste 2, it’s not necessary to know series’ lore in order to enjoy MUSHA. Too many jawbreakers, not enough jaws. 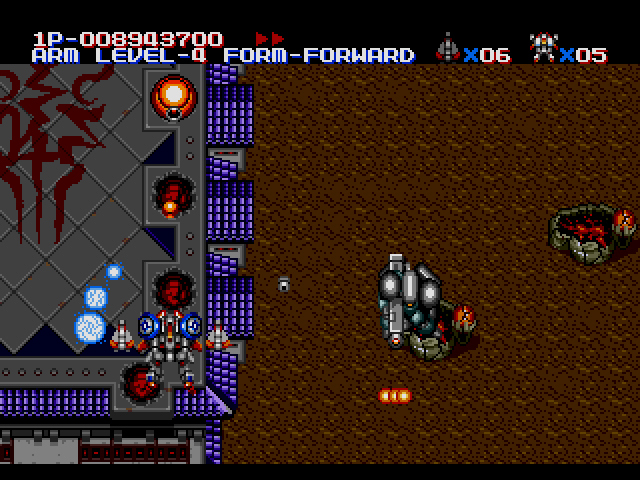 MUSHA isn’t a shoot-em-up for those who have only dabbled in the genre. 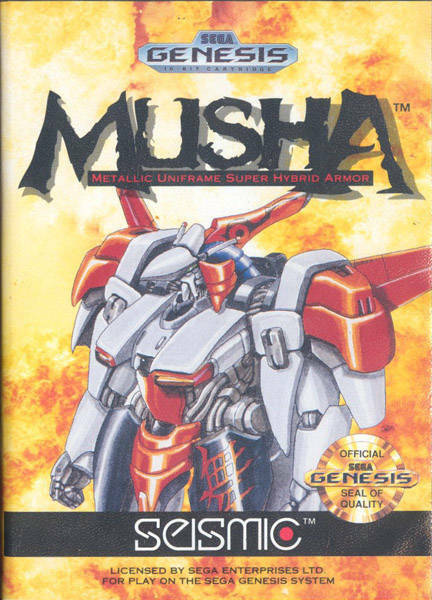 MUSHA is for the jaded old veterans who think they’ve played it all before. The game’s unrelenting energy and passion doesn’t just upstage other shoot-em-ups for the system: it decimates them – and, dare I say, every other title released for the Genesis in 1990. MUSHA is a reminder that shoot-em-ups can thrill better than any other genre, and is a testament to the power lying in wait within Sega’s 16-bit console. An absolute masterpiece and one of the best games on the system. Good work, Ellin- er, Terri! One of the most over-priced games on the system. It’s fun enough, but definitely not worth the going rate. True, but to be fair, I couldn’t fathom paying several hundred dollars for any game, even if I loved it. Agreed. But looks at that beautiful US cover art. Hnnnggg. Thank god you can find good repros for cheap. Total beast of a game. Awesome review Dylan. One thing I would like to add onto the review: the rarity of finding a copy in the wild at any time past 1998. Being a Genesis collector from the Funcoland years, frequenting all of Austin, TX’s retro game outlets, this game never-ever showed up in any condition. I don’t know if I can blame Seismic for the limited quantities of the game, or like-minded Genesis shooter collectors, or the outstanding quality of the title for the rarity. I eventually resorted to a text listing online, describing it as a rental and sent my money away not even knowing if it was loose, complete, or ratty. It all worked out and then the game shot past the triple digit mark and has not stopped even with reproduction carts, Everdrives, and the like. I originally wanted the title because of my obsession with Compile that started on the Master System’s Power Strike mentioned. Grab Compile’s other works if you can. Also, for collectors, do you somehow feel that a loose cart is more special than a complete copy? For some of my titles, that’s the only way I ever got them. Compile started off doing weird SG-1000 ports, then became awesome in the Master System era with games like Power Strike and Golvellius. Can’t wait to play more of their work, though I have heard MUSHA is one of their best. Thanks for sharing about your experience with trying to find the game. All I knew is that the game was triple-digit rare, and while high price points are still fairly uncommon for Genesis games compared to, say, certain SNES titles, I didn’t think it was worth mentioning. Aside from the head banging tunes, it’s a bit overrated. There are some sick covers of this soundtrack on YouTube. People who hate on the Genny sound chip can go kick rocks. I’ve only played this briefly. A friend had it. Would have liked to played more. I wonder if he still has it? 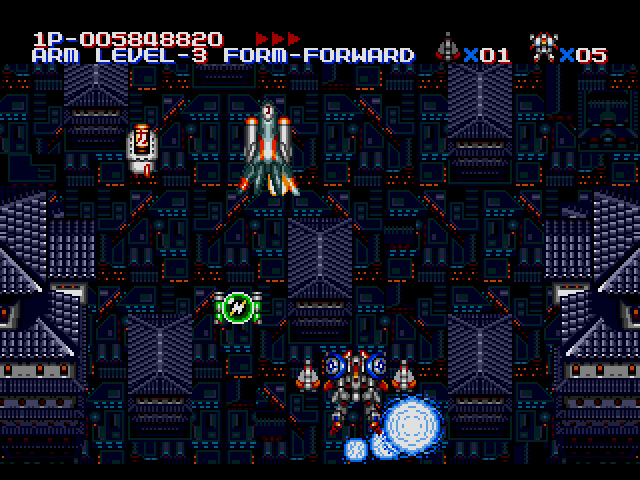 Also look forward to Robo Aleste on Sega CD when you get there. I don’t know why I never bought this, it got amazing reviews at the time. I liked shooters. I guess I just passed on it. I do think this game had limited quantities but I have no source. Going for nearly 500.00 though for a loose copies and over 1000 for new. This is one of the most sought after US releases. I mean looking at the Sega Genesis rankings this is the highest priced cart to collect for. Or very close with Crusader of Centy. I’m inclined to think it had a lot to do with low print runs. I’m going to have to play this now. No game is worth 500 bucks, I don’t care how amazing it is. MUSHA might still be on the Wii Virtual Console, assuming the servers are still up. Those price charting figures are off anyway. Complete ones in variable shape appear to run around the $400-500 range on eBay, going by the finished sales. It’s still way too much for that game, but not nearly as shout-rageous. I saw this at Seattle Retro Gaming Convention last year for $350 and almost jumped on it. Just for the purposes of ripping the OST on model 1 hardware it would have sorta, kinda, maybe, just maybe been worth it. I’m a little surprised that the 16-Bit Audiophile Project hasn’t tackled M.U.S.H.A. yet. It seems like the kind of thing that would be ripe for them to do, and I can’t imagine that no one has a cart (even a cheaper Japanese version) they’d be willing to lend for the recording process. MUSHA is the one game in the Genesis library that I wish I was more familiar with. In part because I never bought it, and in part because it hasn’t ever quite grabbed me the way I was expecting it to when I’ve played it via emulation over the years. Objectively, I know it’s one of the finest shmups of the 16-bit era, and certainly in the top 3-5 on the console, but it hasn’t clicked with me enough for me to love it yet. Part of that is because I grew up playing Lightening Force, and that game surpassed any and all expectations I had for what the Genesis was capable of. Having said that, this is one that I’m giving serious consideration to purchasing a repro cart (this and Grindstormer), because I know that if I sat down with it and played it seriously for a couple of hours, it would probably begin to sink in just how awesome this game is. Sadly, I just haven’t taken the time to do that as of yet. I’ll throw a recommendation to the sequel, however, which itself has now shot up in price. Robo Aleste is, arguably, slightly inferior to it’s cartridge predecessor, but is still a solid experience in its own right, with a reasonably bangin’ soundtrack to boot. Again, I haven’t spent enough time with it, despite having the fortuitousness to pick up a copy over a decade ago, before it became pricey, but I’ve played enough of it to know it’s probably the best shmup on the Sega CD, save, perhaps, for the even more elusive conversion of Lords of Thunder. 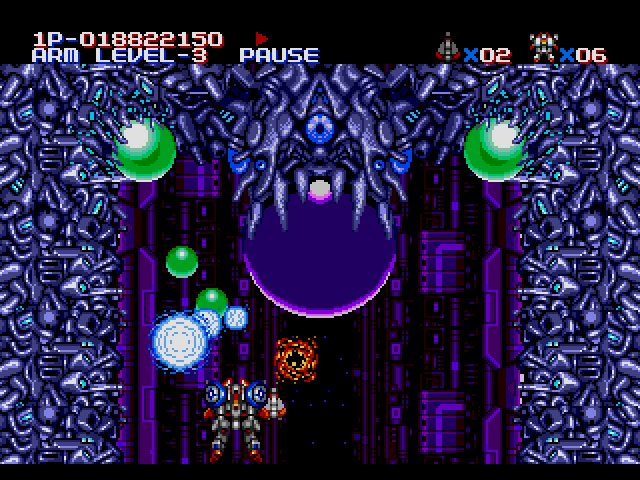 But then I’m a horizontal shmup kind of guy, so that game, with its heavy metal-infused soundtrack, was always going to be a winner for me. Nearly as good is Android Assault, aka Bari Arm. Very solid ship-meets-mech shmup with a great soundtrack, and solid game play. Another Sega CD exclusive, and one that is usually more plentiful and cheaper to find overall. 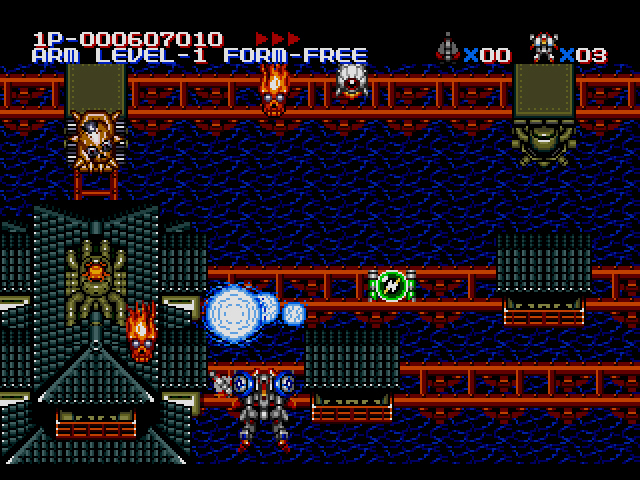 I really love MUSHA; it’s easily one of my favorite vertical scrolling shooters of all time. However, I couldn’t get into Robo Aleste for some reason. I wish my Sega CD still worked so i could give it another chance as I still have Robo Aleste stored at my father’s house. Anyway, the one weak point I’d give to MUSHA is that once you figure out how overpowered the level 4 power up for the blue shield orbs is, you won’t want to use any other weapon. It’s a bit of a game breaker IMO, and I sometimes handicap myself on purpose by choosing never to use that weapon as it trivializes much of the game.